Our Half and Half challenge brought in 8,444 cards—wow on the turnout, everyone! Way to go! 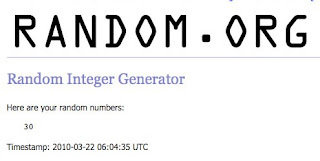 Random.org picked numbers for the winners, and we matched up numbers with the cards donated.....so without further ado....congratulations to these 10 cardmakers! The prizes are all packed up in their flat rate envelopes — tons of stickers, ribbon, stamps, embellishments, and other goodies! With any luck they'll end up going postal tomorrow. Congratulations, ladies!! Mother's Day: April 1! Be quick! 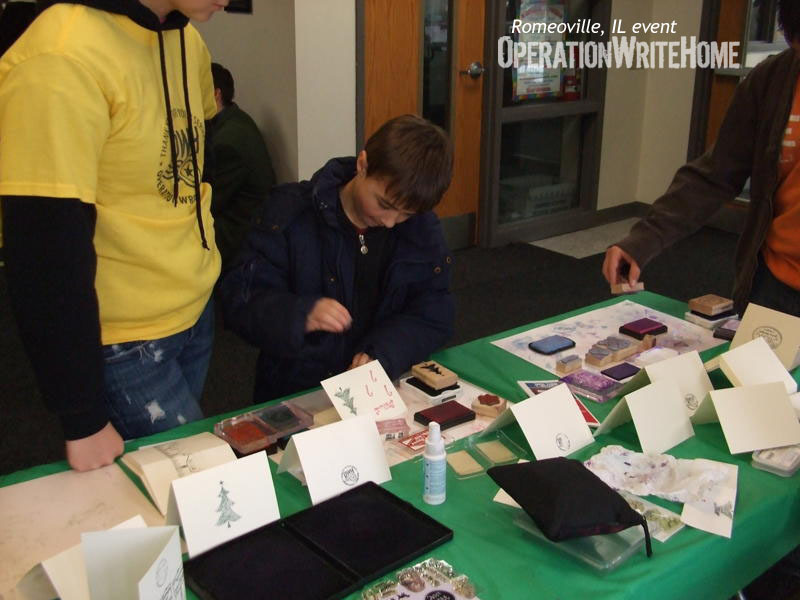 Romeoville, Illinois was the hub of cardmaking action for our heroes recently—scouts of all ages as well as church members got involved in making cards to bless our heroes! This second annual event was once again a great hit with people of all ages. A Girl Scout troop was behind the excitement. "I love to scrapbook," says Joanne N, scout leader of the older girls for the past 11 years, "and I have always tried to find ways to incorporate scrapbooking or stamping into our badges and service projects. 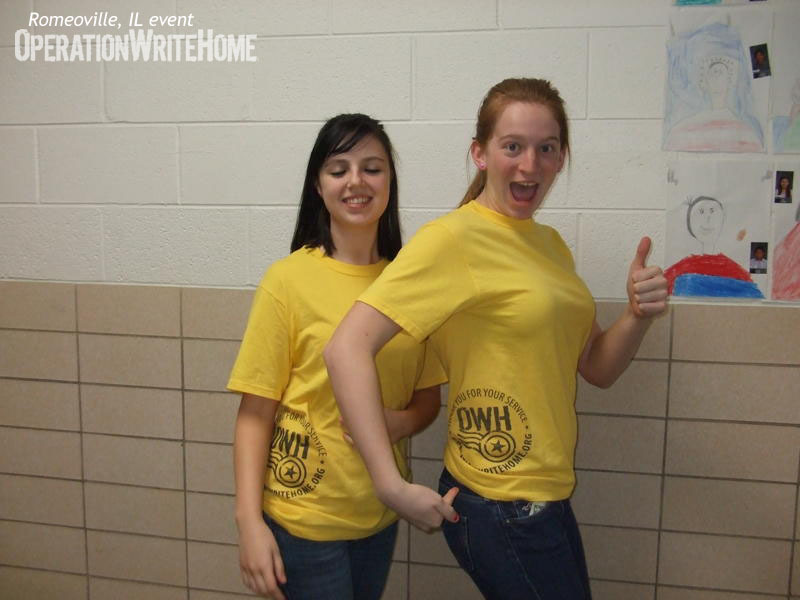 Of course I was thrilled to find Operation Write Home!" 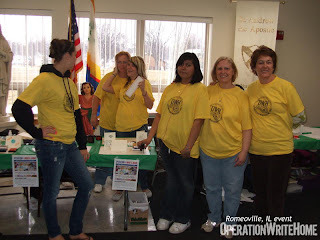 The weekend-long event was held at St. Andrew Church in Romeoville. The scouts set up tables and mini work-stations with sample cards on display and the stamps and inks ready for each card, so that as each church service ended, a person could quickly stamp one or all of the cards. The cardstock used for most of the cards came from JoAnne's office; "'I work for a paper distributor and this was cardstock that was headed for the trash because it had been improperly cut for a customer order. I scooped it up, and the guys in the [company's] cutting center even cut it down to the size for me!" It's a long weekend for all of the volunteers; they stay through the evening masses on Saturday and then arrive again bright and early Sunday morning for all of the morning masses. But they have lots of fun together, said JoAnne, "and it's such a great way to let our service men and women know that we really are grateful for the sacrifices each of them makes for all of us." The group had lots of information about OWH on-hand for curious church members. Part of the scouts' preparation had been using iron-on transfers to make these fabulous t-shirts with the OWH logo to help spread the word! The older scouts had lots of fun working with a younger scout troop as well. 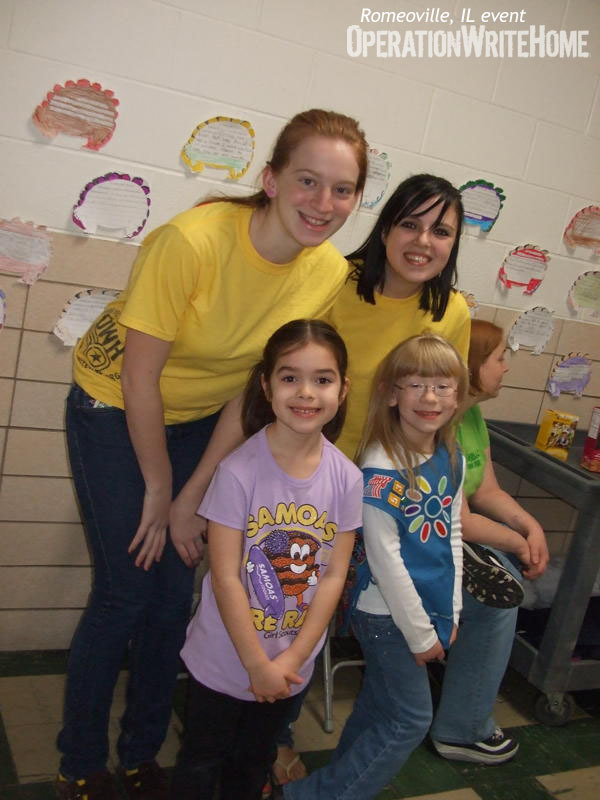 "It's inspiring for [the younger girls] to see older girls still in Girl Scouts," says JoAnne. "It's my hope to pass the baton over to their leader when my girls graduate next year, and keep this annual event going!" The Girl Scouts and their leaders were blessed by being able to serve our nation's heroes. "Thanks for providing such a fun way for us to show our appreciation!!" said JoAnne. And the joy of these cards doesn't stop with the smiles on these faces in Romeoville. OWH shipper, Kris, was impressed first: "What a great box of cards. The girls did a fabulous job on them!" Then just imagine how many heroes will be loving them very soon...and then all those families back home! Many thanks to the scouts of Girl ScoutTroop 603, St Andrew Church, and the town of Romeoville for making the event such a great success! Many thanks to everyone who filled our mailboxes with 9,376 cards! We're getting the last of the Mother's Day cards in, so be sure yours are coming our way quickly; if you still want to make some and aren't sure you'll get them to the shipper right away, make them "Mom" cards and not "Happy Mother's Day," and then if they don't make it quite on time, they'll still be use-able by our heroes! Salina D. in Massena, NY, thanks to you and your son for the terrific cards and hero letters! Well done! Thank you Julee C. in West Chester, OH for sending these terrific cards for our heroes. I can't decide which card I like best! Cindy and the Los Gatos Elk Lodge - thanks so much for the great mix of cards - wow!! D&K, Granite City IL - awesome cards, thank you sooooo much! Sandy H, Lewiston CA - awesome cards, and thanks for the AnyHero ones too! Thanks Dawn M. in Charlotte, NC for all the terrific cards you made for our heroes! Thanks too for your donation for shipping! Dianne W. in Coconut Creek, FL, thank you for your beautiful cards and generous donation. These cards will bring smiles to many! Stephanie and Robin G, New York - thanks so much for the fabulous box of cards, and your generous donation! Teresa K, Vancouver WA - I just love your cards! Your donation is a huge blessing, thank you! Carolyn E, Golden CO - wow, thank you for the generous donation!! Thank you Leslie M. of Bogart, GA! These cards are delicious! You've inspired me to look for my crimper! Joanne M. in Allentown, PA, thank you for the wonderful cards! Looks like springtime! Thank you Katherine G in Lexington, KY for the wonderful cards for our heroes! So many moms are going to love getting these! Thank you Nancy H and the Senior Circle in Williamston, NC for the terrific cards and the MANY letters to our heroes! All are beautiful! Thank you Lily H in Pittsburgh, PA! These labels will be put to good use! Your calligraphy is spectacular! Brianne N and Scrapstreet Crafters - wow!! So many incredibly beautiful cards - congratulations and thank you for the card drive box full of beauties! Thanks Nancy F. in Trexlertown, PA for all the fun cards and the generous donation! I can't wait to see what you do next! Heidi M, Lynnwood WA - awwwwesome cards!! Thanks so very much! Denise W, Las Vegas NV, you're so wonderful, thanks for the cards and extra goodies! Barbara C and Tuesday Craft Group, Tucson AZ...thank you so very much, these cards are terrific!! Rachel P, Marysville WA, thank you so much, your cards are lovely! Cindy H, Edgewood WA - you have such a beautiful embellishing style - thank you for the great cards! Eileen and friends, St Marys PA - love your cards, thanks for them all! Thanks Cheryl B. of Havelock, NC for all these terrific cards! I really like these cards that swing open! So clever! Thank you for the Hero card too! Thank you Anne H. in Wayland, MA for the terrific cards. Such a nice variety of themes and techniques! Thank you! Lori, R. in Springfield, VA, thank you for another beautiful collection of cards! I feel like spring has sprung! These cards with flowers are yummy! Suzzane L. in Vienna, VA, thank you for sending such a nice collection of cards for our military heroes! These are great! Thank you Kimberly D in Lake Mary, FL for all the cards for our military heroes! Wanda J, Indianapolis IN, thanks for these treasures, our heroes are sure to love them! Thank you Linda G. in Ypsilanti, MI for these beautiful cards for the mothers and fathers of our heroes! They're great! Thanks, too for the shipping donation! Thank you Barbara S. of Manville, NJ for this terrific collection of cards! So many! 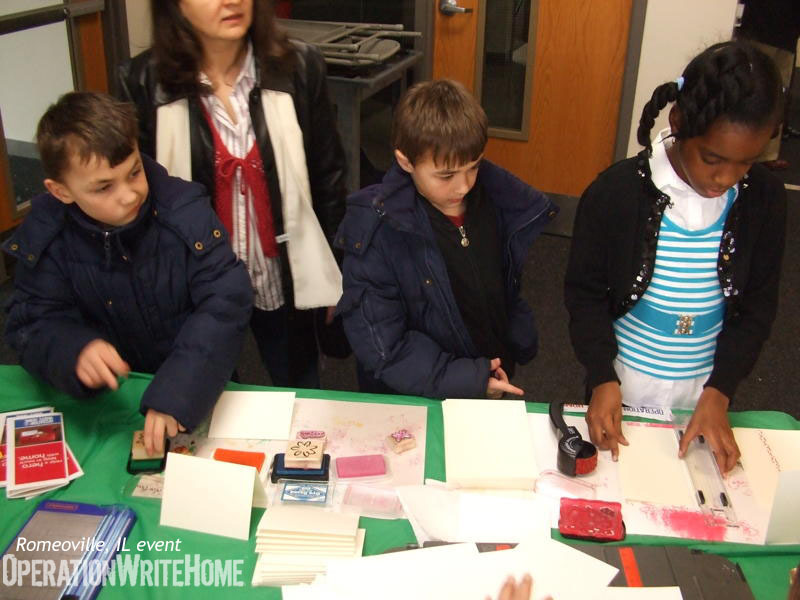 Thanks for making cards for heroes to send to their children! Thank you Ellicott City Rubber Stamp Club in MD for the beautiful cards you sent for our heroes to keep in touch with home. You all do a great job! Mary F. in Pasadena, MD, thank you for these beautiful cards! Love the coffee cup stamp! Thank you Ellen B in Pasadena, MD! Your cards are terrific. I love the cards with the tea bags. Clever! Congrats on reaching your goal of 100! Velda S, Mesquite NV, thanks so much for your cards - hope your stamping arm heals quickly! Lina W, Hampton VA, love your fantastic Mom cards - so cute! Cyndee W in Gahanna OH.....thank you for these beautiful cards! Thank you Dawn M. in Charlotte, NC for the quick response to the need for Hero mail. Thanks too for the shipping donation. Carol G. in Tuxedo, NY, thank you for these stunning cards! Wowzers! Thank you for the shipping donation as well! Thank you Angela H. of Wayne, MI for this terrific collection of cards! So many techniques and sentiments. Thank you too for the generous donation! Thank you Marsha L. in Sheffield, OH for these beautifully colored cards! Wow! Thank you too for the generous donation! Chris L, Leavenworth KS -- thank you for your ongoing donations to support your heroes! Tonia S, thank you so much for your donation, and even MORE for your service to our country. Please stay safe out there! Nancy S in Palm Harbor FL.....thank you for the beautiful cards!! Liz M in St Charles MO.....these are beautiful! Thank you!! Jeanine D in Cleveland TN......another fabulous box of cards! Thank you!! Beverly D in Rochester NY......another great package of beautiful cards. THANKS! Sherrilee C in Minneapolis MN.....thank you for the beautiful cards! Susie W in San Antonio TX.....thanks so much for the wonderful Mother's Day cards!! Love them. Susan M and Mt Pleasant Public Library.....thank you so much for holding events and accepting cards from your patrons. These are wonderful and what a big box!! JoAnne N and Girl Scout Troops 603 & 53.......WOW!! Girls you ROCK. This service event was a big success based on the number of cards you all made. Love the pictures too!! Keep up the GREAT WORK! Carol C and Sue S in Papillion NE......ladies, thank you for another great package of cards. Appreciate you continued support. Tammy F and Trevor's Tuff Momma's......another box of FABULOUS cards. THANKS! Beth L in Howell MI......thank you for these fabulous cards! Patty R in Hartland MI.......thanks for the beautiful cards. Nan A in Folwerville MI......these are gorgeous cards! THANKS! Leah C in St Paul MN.......another fabulous box of beautful cards! Thanks! Brenda R in East Bethel MN.......thank you for these fabulous cards! Maude B in Las Cruces NM.....thanks so much for another great box of gorgeous cards!! Lynne H in Tampa FL.......these are beautiful cards! Thank you! Nancy T in Katy TX......thanks for these fabulous cards!! M R Smith in Maryland Heights MO......thank you for the beautiful cards! Sue A in Rockford IL.....another great package! THANKS! Judy B in Cleburne TX.....thanks for a great package of cards!! Kim P in Orland PArk IL......thanks so much for these wonderful cards. Love them! Kelli D in Paragould AR......what a wonderful package! Welcome to OWH!! Laurie and the Kindergarteners at Denver Christian School.......thank you for these wonderful Any Hero letters. Our heroes will love them! Tami P and friends, Vancouver WA, thank you so very much - great cards, everyone! Laurie J, Houston TX - great package of cards, thank you so much! Nina L and Christine W, Sacramento CA, thanks for pouring your hearts into all these cards and AnyHero letters! Thank you Amy P. in Harrisburg, NC for these beautemous cards! I can always count on you! Thank you Barbara C. in Lunenburg for these terrific greeting cards! Thanks a million for the Hero Mail!! 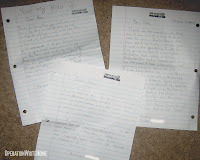 Thank you, Sue S. in Hendersonville, TN for the Hero Mail!! I sure needed it! Thank you, Joan J. in Lodi, CA for sending hero mail all the way across the country! You rock! Thank you, Nancy F in Trexlertown, PA for the Hero Mail! Awesome! Danyse K. in Charlotte, NC!! Thanks for the hero mail! Awesome! Thank you Debbie K in Burke, VA for the cards for our heroes to send home and the hero mail! You rock! Kimme L in Westminster, MD, your cards are beautiful! Thank you for sending so many different sentiments and so many designs. Beautiful! Thank you to the Goshen 4-H Club for these terrific springtime cards for our heroes! Thank you too for writing letters to our heroes! They are going to love those! Thank you Eleanor G in Manasquan, NJ! These cards are wonderful! Thank you too for the donation for shipping! Reta M in Fair Oaks Ranch TX.......thanks so much for these awesome cards! Love them! Elaine L in Freer TX.....what a wonderful packages of cards. Thanks for the Any Hero cards...I was in need of those! Rebecca S in Munster IN......thanks so much for these wonderful cards! Rose M in St Louis MO.....thank you for these great cards!! Patti J and Friends in Milwaukee WI.....Welcome to OWH! The cards you sent are wonderful!! Jocelyn B in Sun Prairie WI.....thanks so much for these great cards!! Susan D in Tinley Park IL.......a wonderful package of beautiful cards! Thanks. Mary Ann S, Fontana CA - lovely cards as always, bless you! Thank you Sara K. in Beavercreek, OH for these terrific cards for our heroes to send home! Thank you too for the donation! Lisa S. in Jacksonville, FL!! Thank you for these beautiful cards! I love these Mother's Day cards with the flowers! Lovely! Thank you too for your generous donation! Cindi Y in Fort Collins CO.....thanks so much for these beautiful cards! Ann M in Hutchinson MN.....thanks so much for these FABULOUS cards. Kathy H in Lake Charles LA.....thank you for your package of beautiful cards!! Esther E, thank you so much for the beautiful cards - and generous donation! Thank you Dolores A in Frederick, MD for these terrific cards for our heroes! Thank you too for writing notes to our heroes and the generous donation for shipping! Mary H in Miamisburg OH......WOW what beautiful cards and so many of them. Thanks! Ruby G in Thornton CO.......beautiful cards! Love them!! Christine C in Warren MI......thank you for this great box of beautiful cards!! Sandy and Jess C, Beloit WI, thank you so much for your continued generosity! Martha G and Crosses Community Church in Elkins AR......thank you so much for these beautiful cards! Joan R, Vancouver WA - our heroes are going to love your cards so much, thank you!Your donation is a generous blessing! Patricia N in Tulsa OK.......another wonderful package of cards! Thanks! The title of this blog post might seem either misleading or impossible, but it was indeed accomplished recently! The even-more-amazing part was the quality of the cards that were created; this group was going for quality over quantity, and ended up achieving both! 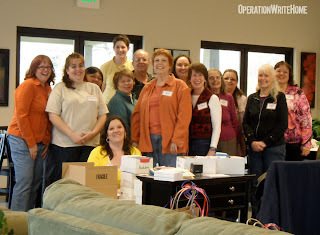 On March 13, 2010, crafters from all over Washington gathered on post at Fort Lewis at 1pm. The hostess, the wonderful Rebecca W—who happens to be married to the hero who made this fantastic MRE card—had secured the location for the party on base, and oh what a beautiful place! Big sturdy tables, lots of chairs, a counter full of munchies. It was even a sunny day, so the bright sunshine streamed in the windows and cheered everyone on. Add a lot of people with crafty skills and passion for our heroes, and it was a recipe destined for success! The gentleman in attendance (who was teased about being in charge of this rowdy bunch of ladies!) is the husband of one of the crafters, and he spent the entire time stamping the backs of cards that had been sent to the local shipper without being stamped with "Operation Write Home" on them. (These were saved just for him, since he loves that job!) 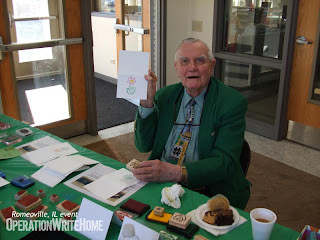 Bob singlehandedly stamped the backs of over 500 cards, and he performs "the tuck" par excellence! The rest of the group spent the 5 hours gluing, tying, and punching, as well as chatting, laughing, and sharing stories. There were all sorts of styles of cards—from colored images, to patterned paper with stickers, solid stamped images, layers of nestabilities, popdots, and ribbon galore. A cuttlebug fever broke out (did anyone notice an uptick in Provocraft stock value after the party??) and a short lesson in embossing and diecutting with nestabilities ensued. Each of the cards made that day came out so very pretty‚ and everyone left the party feeling incredibly accomplished. The outcome: 527 amazing cards! What was their secret? Preparation. Each person had been asked to bring a card kit with them, enough to make 20 or so of their design. These kits are where the time and energy was invested, all prior to the party. The cards were designed, stamped, trimmed as needed, and embellishments prepped—all before ever heading to base! That meant the only stamping to be done was sometimes a sentiment (and some brought sentiments already stamped too). No coloring was needed. No cutting of papers or embossing. This took some commitment by the crafters, but proved to be well worth it on the day of the event! Here are a few tips if you'd like to try a party like this one! Prepare kits. 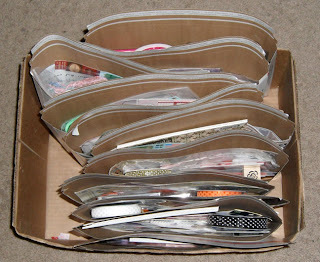 Ask your crafters to make their kits ahead. We asked for about 20 of each design, but you can adjust that based on the number of attendees; we hoped for 20 people, so aimed around that. Kits should have almost all stamping done ahead—that leaves inky messes at home. Papers should be cut to size, ribbon can be on rolls or cut to length. Any tools needed for that card should be provided by the cardmaker — scissors, adhesive, holepunches, etc. 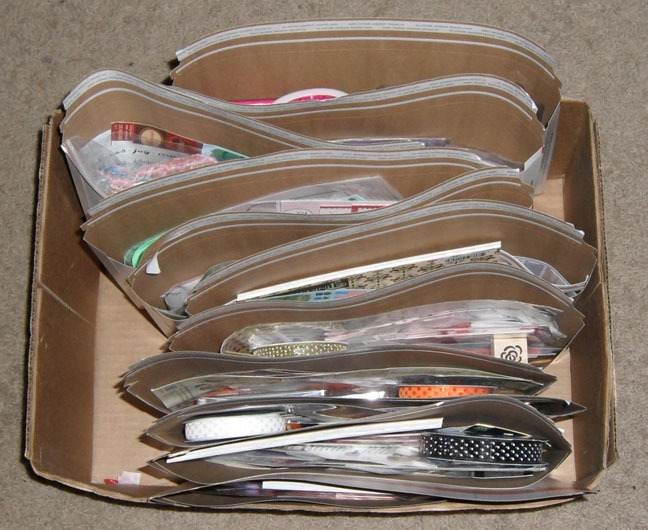 Suggest the entire kit be brought in a shoebox, to keep it all together, and tools should be marked with the cardmaker's name. Instruction sheets are also helpful, and a sample card is needed too. Go for quality. Setting a high goal sometimes can make people try to think of the easiest design they can—but that's putting quantity first. Our heroes deserve beautiful cards, so encourage your attendees to get their mojo on! Cards with pattterned papers and layers can be assembled quickly, even by newbies; they just need to be prepped ahead of time. Go for variety. You can suggest a theme or holiday, but the best packages our shippers get have a little of everything in them. Any style is okay — and a variety of styles allows everyone to see how others put their cards together. Hostess: have extra supplies on hand. Someone will invitably need something extra — a paper cutter or Cuttlebug, pair of scissors, a pink marker, a pack of brads. Rather than having everyone bring their entire roller cart of stuff, have one person designated to bring The Stuff. Provide snacks. Either the hostess or the cardmakers, or a combo. Greaseless foods recommended, and bottled water to keep from spilling! Set up the room. 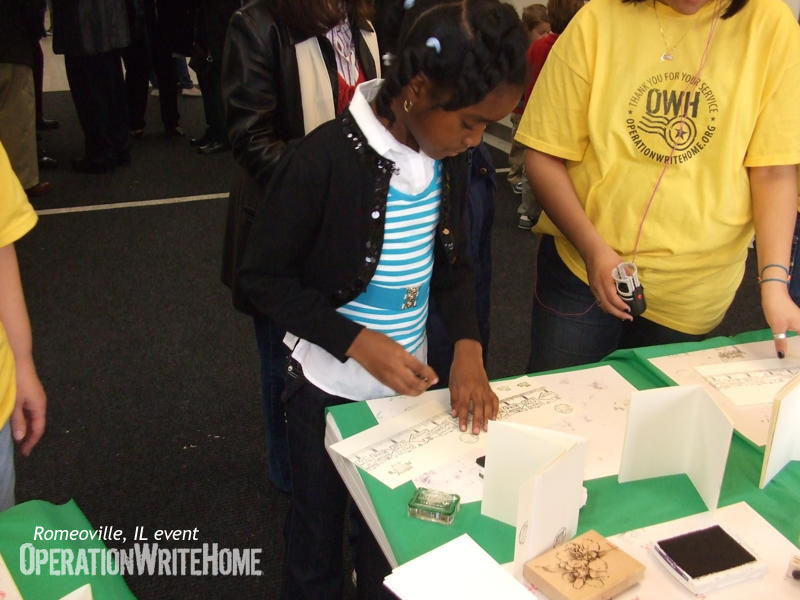 Have tables prepared before everyone arrives, with a sheet of scratch paper or cardboard at each place. Have trashbags or boxes at each table (bag or box in the center, or paper bags taped to the sides of the tables.) As each person arrives, have them set up their card in front of one of the spots—supplies, sample card, tools, instructions. Each cardmaker should be encouraged to try making one of each card provided, by moving around the room to each place. (Some parties prefer to pass the shoebox down the table, but with some cards taking longer than others, that often gets bottlenecked.) Moving around the room also means people sit next to different people all the time, and everyone gets to know each other! Take photos! 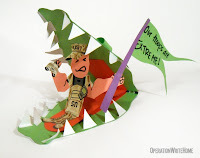 Submit them to OWH along with your own article about your event and tips about cardmaking parties, and we can to post them here or on Facebook to encourage other cardmaking groups. Optional: include a design-your-own card! It might be fun to have one of the card kits allow for design creativity. We suggest only one or two of your designs be of this type; these are much slower to produce! Try a themed kit: ours was love. Provided were 3" x 5-1/2" strips of pink and red patterned papers that match, packs of stickers in coordinating colors, coordinating ribbons, and a border punch. This guaranteed the cards should at least go together fairly easily; if you set out a box of unmatched items, it's much harder to come up with a design idea while trying to sort for random pieces that match each other as well. Avoid "sticker sneeze"* by having a sample design or two done (pictured above); if you're providing stickers, showing them how your stickers are intended to be used with your provided papers is helpful in guiding them. *sticker sneeze: random stickers placed on cardstock...achoo! And remember throughout your event and it's preparation: this is supposed to be fun. Don't let a quantity goal get in the way of enjoying yourselves! Relax and enjoy each others' company. Rest assured you're making a huge difference for our heroes and their families! Happy Mailroom Monday, everyone! This week 3,912 cards were shipped out to heroes deployed overseas...well done! (Shipping cost: $150.00) The 13 boxes shown here will ship sometime in the coming week—100 Mother's Day cards in each one! Congratulations! We'll be getting your prize out to you shortly! If you've already been hopping around, we hope you've got a moment to put up your feet and relax with us here! Go take a quick break, pour a fresh glass of your beverage of choice, then kick back and enjoy this nice video we found on YouTube....it's a lovely piece of music with photos collected from around the web. And for those who are ready to be amused, here's a silly story for you. Once upon a time there was a plan. That Plan was to get lots of friends together to post on their blogs and share their creativity. That was a beautiful Plan. Then along came reality, named Technology. And Technology kicked the tail of the Plan. This little blog post was not acceptable to Technology, so it had to change. In addition to which, the grace extended to me in the midst of piles of emails sent and re-sent while organizing bloggers has been a HUGE blessing. So the "friend" card is wayyy appropriate for the last stop on the hop! You are all friends to me, and I'm blessed because of you! 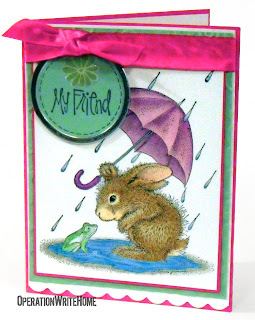 What friendship have you made or has been made better because of cardmaking? And for those who commented on the other card before I swapped out to post this one, you get entered for the drawing anyway. Because that's what friends are for! Rain or shine, technology or plan, you've all been there for me, and I'm grateful! If you've been inspired or if you're just feeling bummed that you didn't sign up ahead for our hop, go and post on your blog too. Leave us a link so we can come visit you too! (If you use this sketch, please link here too so we can see what you created! If you did NOT receive it, please email right away! For some reason a few folks haven't been getting emails from us, and you'll need the link in the email to get your post done. THANKS! We're so 'tankful' that this week we received 6,256 cards — plus all the ones waiting for Kris to return from vacation! When she's back next week and processes the donations (and looks at postmarks to see whose would have made it on time! ), we'll draw names for our Half and Half challenge winners. Thanks for your patience! Hope everyone's ready for lots of fun and excitement this Saturday at the bloghop! It's not too late to sign up; we have 84 blogs participating so far....including a couple great surprises! Shirley T, Faribault MN, thank you for all the great cards, they're just lovely. Sandra F, Irvine CA, thanks for the sweet cards!! Chris C, Parkland WA - thanks for the great selection of cards! Thank you Lori R. in Springfield, VA for your box of cards. Thank you especially for thinking of the children of our heroes! Donna D. in Monroe, LA, thank you for the terrific cards! I love the spring flowers on the Mother's Day cards! Lovely! Thank you Debbie S and Wanda A. in Gastonia, NC! What terrific cards you sent for our heroes! Lovely. I can't wait to read all these notes te children wrote to our heroes. Thank you too for the generous donation! Ruth Ann G, Gilbert AZ, great Half & Half cards, thank you! Your donation is much appreciated. Darlene A. in Palm Bay, FL, thank you for the cards for the half and half challenge! I love the cards with the dragonflies! Thank you for the letters to heroes too! Thank you Heather V. in West Monroe, LA! Your cards are beautiful. Thanks for sharing your talent with our heroes! Kate M, Bossier City LA, thank you for the wonderful cards - and your sweet note and donation! Thank you Wendy S and Meg S. for the huge collection of cards you made for our heroes as well as the generous donation. Well done! Thank you Ruth B. in Hillsborough, NJ for this wonderful box of cards for our heroes. Love the springtime colors! Brenda C, Mount Union PA, thanks for the lovely cards, our heroes will love them! Judie F, Coeur d'Alene, ID - such pretty cards as always...thanks for joining in the Half n Half challenge! Denise W, N Las Vegas NV, your cards are wonderful, thank you so much! Terri L, Grants Pass OR, thank you for the great birthday and thinking of you cards - they're lovely! Carol P, Peoria AZ, I just love your style - thanks for the great Half and Half selection, and generous donation too! Thank you Elaine H. in Keene, NH for the Mother's Day signs! I can't wait to see our heroes with them in pictures. This should be fun! Thank you Erica C. in Kenmore for the cards and the generous donation. Your cards always fill the holes in my stash! Keep up the good work! Thank you Julie C. of Princeton, IN for these terrific cards for the Half and Half Challenge! Love the Mom's Day cards! Thanks for the donation too! Thank you Cheryl B in Havelock, NC for the cards for the Half and Half Challenge, the donation, AND the hero letters! Clever Father's Day cards! Niki Ray B in Independence MO.....these are beautiful cards! Thank you. Janet P in Lawrence KS......thanks for dropping off these wonderful cards!! Martie M......what a wonderful box of cards! GORGEOUS! Chris F in Monument CO.....awesome cards!! Thank you. Linda M in Marietta GA.....WOW what a box! Thanks so much for these fabulous cards! Jeanne B in Chicago IL.....You did great on the embossing! Love these cards. Joy O in Carmel IN.....these are gorgeous cards!! Love them! Diane L in Wichita KS.....thanks for these gorgeous cards! Love them. Julie P and MOMS Club of Topeka KS.......ladies thank you for these wonderful cards. They are great! Betty T in Salina KS......another great box of beautiful cards! Thanks! Cindy B and Karen E in Dearborn Heights MI.....ladies thank you for these beautiful cards!!! Dee N in Duluth MN.......FABULOUS cards once again! I just love your style! Janice D in Rochester MN.....this is an awesome box of cards! Valerie B in Farmington NM.......what great cards! Love them! Helen M in Spring Creek NV.......thank you for the beautiful Mother's Day cards. Marina J in Huber Heights OH.....BEAUTIFUL!! Thanks so much for these great cards. Thank you Patricia F. in Hixson, TN for this beautiful collection of cards for the Half and Half Challenge! Love the cards with the bird punch!! Jeanine D in Cleveland TN....Thanks so much for these wonderful cards!! Suzanne E in Hendersonville TN.....thank you for these awesome cards! Love them!! Janet C in Kennedale TX......thank you for these awesome cards!!! Diane B in Forney TX......Love these cards, beautiful!!! Lori V in Black Creek WI.....these are fabulous cards! Love them!! Thank you Kathy C. in Ilion, NY! Your cards are always so pretty! Thanks too for sending the hero mail from the children! They're wonderful! Sarah H in Washington, DC, thank you for such a nice batch of cards for the Half and Half challenge! Well done! Thanks too for the hero letter! Gail H in Orchard Park, NY, thank you for the beautiful cards for our heroes to send to their families and friends! Jann H, Parker AZ - you've just made soooo many Moms happy with all these cards, thanks! Fran T, Cabot AR - your cards are always so pretty, thank you! Girl Scout Troop 1774, Phoenix AZ - great job on your cards, thank you so much! Jane and Monica, Lakewood WA - lovely cards, thank you so very much! Esther E, Vancouver WA, awesome batch of cards as always...thanks so much! Jean B. in Meadville, PA, thank you for the cards, the donation, and the letters to heroes! Love the puppy cards! Too clever! Thank you Sherrie M. in South Orange, NJ for the terrific cards, the generous donation, and the terrific letters to our heroes! Lily H. in Pittsburg, PA, thank you for another beautiful box of cards for our heroes! Thanks too for the boxes of pens. I love packing those in boxes! Thank you Jody V. in Chester, VA for the wonderful cards for our heroes! Thanks too for all the letters for our heroes from the 3rd graders at Harrowgate Elementary School! Lauren L. in Plainfield IL, thank you for the box chock full of cards for our heroes! Well done! Lina W, Hampton VA, your cards are adorable! I just love those little cherubs! Kim N, Bloomington IL, what adorable cards! Wow!! Our heroes are going to love sending these home! Donna thanks so very much for the great package of cards!! I needed these very much for the next boxes! Seongsook D, Elk Grove CA - such pretty cards, thank you so very much!! Kathy S,Reedley CA, your cards sure made it in time - thanks so much!! Oh, my! Thank you Patti C in Ruby, NY for the cards and the donation! I may be up all night playing with these card designs. Simply beautiful!! Cheryl Y, South Pasadena CA, thanks for all the awesome Mom cards, and your generous donation! Debbie A, Irvine CA, thanks for joining in the Half and Half challenge --great cards!! Your donation is a blessing too! Jody M, Scottsdale AZ, you know how to inspire a shipper to sit down and make a card --- beauuuuutiful work as always! Thank you for the donation too! Melrose V, Linden CA - so glad you sent these cards in, they are so pretty!!! Chris C, Parkland WA - wow, even more cards this month, thank you! Thank you Meighan S. of Pittsburg, PA for these terrific cards for our heroes! I really needed these all occasion cards! Thanks too for the envelopes! Kathie S in Sterling Heights, MI, thank you for the beautiful "Artful Greetings." So many unusual cards for our heroes! Thank you, Christine C in Bayonne, NJ for the beautiful collection of cards! Our heroes will love sending them home to family and friends! Thank you Amy P. of Harrisburg, NC for these terrific cards! You rock! Our heroes will love these cards! Jayne A, Sacramento CA - your cards are lovely...thank you so very much! Joan J, Lodi CA, your patriotic dog cards are just adorable!! Patty S, Santee CA, bless you for all these awesome cards...WOW! Linda G, Ypsilanti MI, thanks so much for your donation! 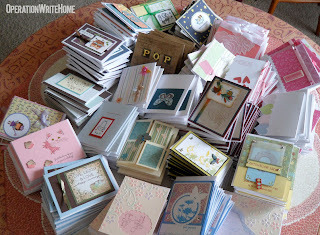 Debbie F, Monrovia CA - what a lovely box of cards - and great donation! Thanks!! Laura O, Cottontown TN, thanks so much for the cards and generous donation!! Many many companies give matching gifts - either based on your donations to a nonprofit, and some who make significant grants based on your volunteer hours. A number of them have a deadline of March 31st to verify your 2009 giving and volunteering, so check right away with your HR department (or your spouse's), or search your company intranet for a Matching Gifts program link. If you require hours or donations to be verified, please email us right away so we can beat your company's deadline—don't let a great company benefit sit on the table! Use it for our heroes! Does your company have a Matching Gifts program? Leave them a shout-out in a comment...they deserve kudos for supporting causes their employees care about! This week 1,645 cards were shipped out to heroes deployed overseas...and those watching the Mailroom Monday posts know that's a very low number compared to our usual. Before you panic, remember that last week we shipped out 12,315 cards! We had gotten the last of the Easter cards shipped out, and this week we could rest—just a little—as we take a deep breath before Mother's Day cards start winging their way overseas next. Please note that Kris is on vacation this week; her mail carrier is holding her packages for her, and she will get to opening, sorting, and reporting as soon as she's back! We'll be holding off on drawing the winners of the Half & Half challenge til then, so those whose packages arrive at Kris' house today will still qualify for entry. Half&Half Challenge: by today in the hands of the shipper! Our heroes love getting cards and letters from young people! Their pure and heartfelt messages—and their spelling of "solgers"—encourage everyone to smile! 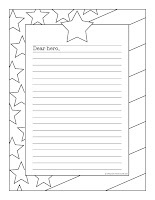 "AnyHero" cards, letters, and drawings are a wonderful activity to teach the importance of saying thank-you, the value of honoring service to our country, and the kindness of sharing their heart with someone else far from home. 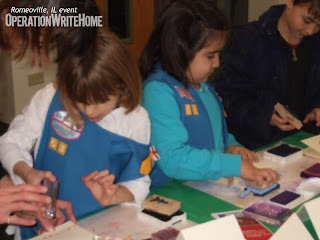 It's is a great activity for classrooms, scout troops, Sunday schools—or keeping little fingers busy while Mom makes cards for our heroes to write home on. What's the best way to get children involved? Are there any restrictions for kids' art? No glitter, and no violent imagery; everything they make should be smaller than or fold down smaller than 8.5 x 11. Our shippers read all letters to screen out things that are inappropriate ("I hope you don't die" is a sentiment we see often; though true, it's not good to send to a hero.) Art can be a 3d piece like this crazy-cool alligator, as long as it folds down flat. Otherwise—anything goes! For paintings or drawings: finished size should be no larger than 8.5 x 11 - or it should fold down to smaller than that size. Art supplies: Do not use glitter. Kids can use pencils, crayons, markers, stickers, paints, rubberstamps, foamies - kids get creative with any materials! Ask the children to think about what they’re free to do because of what our heroes do - they are safe, they go to school, they live with their families, they have a great future ahead of them, and they don’t have to be scared. Help out little ones - Some leaders write a sentence on a chalkboard to help little ones with words and spelling; some will write a list of the hard-to-spell words and the children can write their own letters with that help. Positive messages are best - thank you, we appreciate you, come home safe. Where do I send the letters when they're finished? 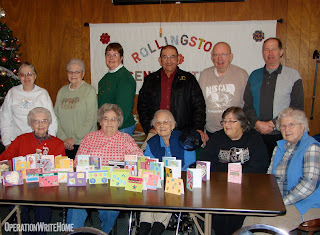 On this Thankful Thursday, here's a great photo of some seniors in Minnesota who gathered a few months ago to make cards for our nation's heroes...just look at those smiling faces! We're reminded regularly how much OWH blesses those at home, not just our heroes overseas . . . and it's so great to know how much it means to you, the cardmakers, too! Feel free to include notes on your Packing Slips and share your experiences too...send photos if you're able, we love to share smiling faces on our blogs! This week we received 6,259 cards....thank you everyone! Thank you Brooke B. in Leonardtown, MD! These are terrific cards! Love the "crabby" cards! LOL! 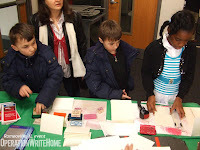 Many thanks to the Scrapbooking Club at Wheelock College in Boston. MA! Your cards will help a lot of heroes keep in touch with home! Well done! Thank you, Cheryl B. for these beautiful cards. I love these birthday cards for kids! Terrific! Visual Art II Class at Coffee County Central High in Manchester, TN, your cards are terrific! Thank you for sharing your talent with our heroes so far away from home! Well done! Thank you Jennifer H. in Laurel, MD for the cards and the extra envelopes! I love that bird paper you used! Thanks for sending the pens for our heroes! Joanne W. in Fort Mill, SC, thank you for these lovely cards! Your cards for celebrating Mother's Day are beautiful and clever! Well done! Thank you Marlyn M in Fox Lake, WI for the terrific cards and the donation for shipping! Many thanks, Pam C. in Schenectady, NY! Your cards are wonderful and your donation is generous. Thank you! Thanks, Stephanie G. in New York for the cards. Those are some happy cards! Love the buttons! Thanks too for your donation for shipping! Thank you Caro H of Mint Hill, NC for the beautiful cards for the Half and Half challenge! Thanks for providing the color challenge for Stars and Stamps! Carolyn L, Darien IL, thank you soooo much for your beautiful cards! Our heroes will love them! Dawn B and Linda G, Cape May NJ - yowsa on the huge box of cards...thank you!! Thank you Kelli W. in Downer's Grove, IL, The Veterans of Foreign Wars Century Post 503 and its Ladies Auxiliary as well as Boy Scout Troop 181. This beautiful box of cards was the combined effort of ages 8 to 89! Well Done!! 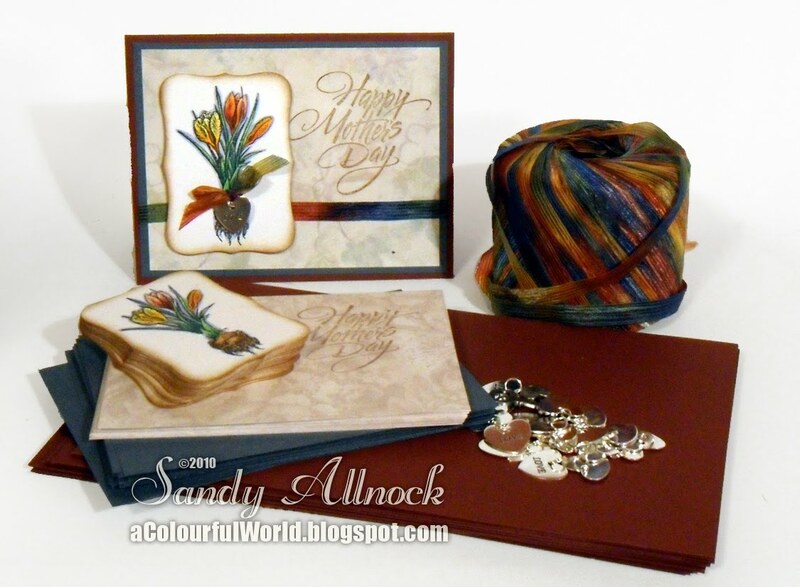 Marteena S and VFW Aux 4015 - wow, so many cards in one box - lovely, thank you! Paula P, Rathdrum ID, your cards are just yummy; thank you for the generous donation too! Thank you Sandy F for all the cards you've made this year! They are beautiful! Thank you too for writing notes to our heroes! 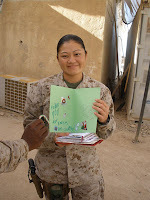 Seongsook D. in Elk Grove, CA, thank you for this terrific box of cards for our troops! I really needed those "Thinking of You" cards! Love your style! Thank you Stephanie G. in New York, NY for sending the cards for the half and half challenge! Great cards! Thank you, Trudy P. from Merritt Island, FL for the terrific cards! They look like spring and summer! Thanks too for the generous donation! Anita S in Beaver Dam WI......thanks so much for collecting these wonderful cards from the community. Christine A in Downers Grove IL......thanks for these beautiful cards!!! Thank you Cindy J in Greenacres, FL for the boxes of cards for our military heroes! Debby M in Las Cruces NM.....another fabulous package of cards! THANKS! Jackie E and Girl Scout Troop 3075 in Rockton IL......WOW! You girls did a fabulous job drawing and coloring these cards! Thanks! Janice D in Rochester MN.....WOW! What a wonderful box of fabulous cards! Thank you Karen G in Oakland Park, FL! Tour cards are a treasure! Thanks for writing letters to our heroes, too! You rock! Karen B and ScrapNMemories in Ft Worth TX.....these are gorgeous cards! Appreciate your support! Kathleen M and Las Noches Woman's Club in Tempe AZ......ladies, thank you for all these wonderful cards!! Kathy R in Livonia NY.....Gorgeous Mother's Day cards. They will bring a smile to a mother's face! Lauri I. in Hamden, CT, thank you for the lovely box of cards you sent for our heroes. Thank you too for the generous donation and the letter to a hero. Love the cards for children! Mara A. in Westminster, MD, thank you for these beautiful cards for our heroes and for the envelopes! Thanks for the generous donation for shipping too! Pat C. in N. Fort Myers, FL, thank YOU for this terrific box of cards! I can't wait to dig in and see all the good stuff you made for our heroes! Thank you, Particia M. in Nashua, NH! LOTS of pretty cards for our heroes! You rock! Renee H in Andover MN.....these cards are awesome! Thanks for all the different themes. Thank you Therese D. in Lewiston, ME for these beautiful cards! I love the frog in the pocket cards! And the birthday cards for little boys! Thank you Cindee N. in Harrisburg, PA! Beautiful cards for moms! Thanks too for the generous donation. 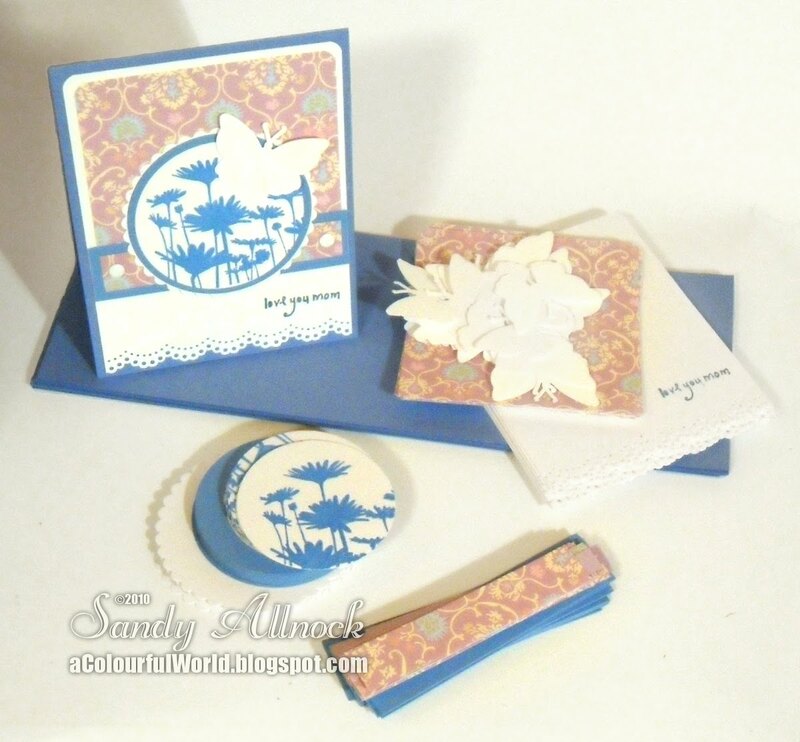 Cindy M in Normal IL........another absolutely fabulous box of beautiful cards. THANK YOU! 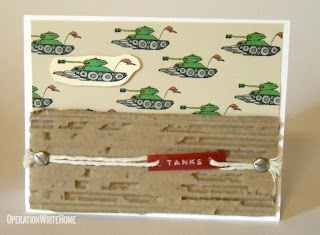 Cindy M, Pewaukee WI - love your cards as always, and our heroes will too! Thank you! Thank "Ewe" Cristy D. in Charleston, WV! These cards are great for our heroes! Ewe are very clever! Thank you Ellen D. in Penfield, NY! Your cards are wonderful!! I love the flower cards! So pretty. 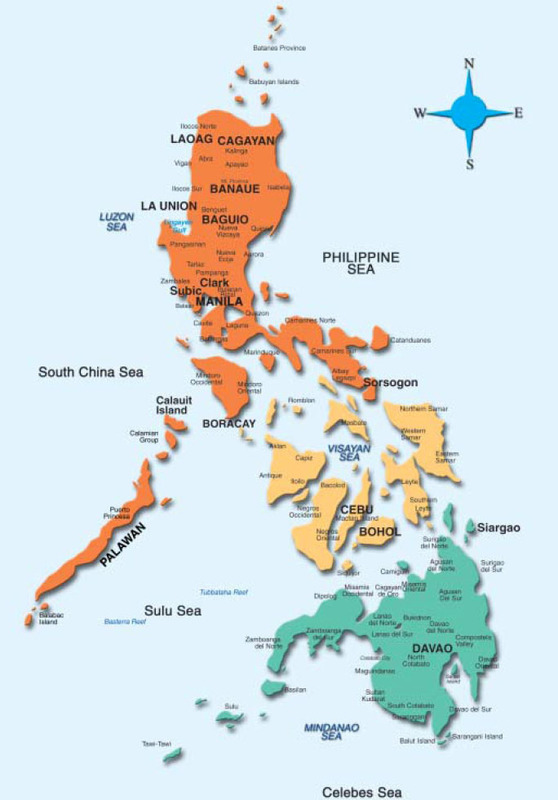 Thank you too for your generous donation! Jamie P in Pittsburgh, PA, thank you for the terrific cards! Our heroes will love sending these. Thank you, Jean A. in Royal Palm Beach, FL for these TWO boxes of beautiful cards! Wow, lots of heroes and their families will love these. Thank you too for your generous donation! Karen H in Monticello MN.....Stunning cards!!! Love the color combos and the father's day card is just too cute! Katrin J in Germany......How wonderful to receive cards all the way from Germany. Your cards are beautiful, your notes heartwarming....THANK YOU!! Kelli L in Hanover MN.....what wonderful and beautiful cards! Love your style! Mary S in Taunton MN......I just love these cards, so very pretty. Thanks! Rebecca P in VA Beach, thank you for all the terrific cards! Love the wallet cards for Father's Day! Hope some hero puts a dollar in there for dear old Dad! Sandye C in Ft Wright KY.....thank you for these beautiful cards. Love them!! Thank you, Sue S. in Hendersonville, TN for the box of beautiful cards! You've sent me a good start for my graduation stash! Thank you too for the donation and the letter to a hero! Susan S. and Seashore Stampers in Egg Harbor Twp., NJ, thank you for the terrific cards for our heroes, and thank you for the donation! SuzAnn H, Salt Lake City UT, thank you so much for your ongoing financial donations!! You're a blessing to our heroes! Thank you Dawn M. in Charlotte, NC for the terrific cards for the half and half challenge! Our heroes will love them! Thank you Debbie T. in Charlotte, NC for these beautiful cards for our troops! Well done! Donna D, Monroe LA, thanks sooooo much for your generous donation! Glenda L in Charlotte, NC, thank you for the cards and the generous donation! I love your bouquet of flowers on those Mother's Day cards!! Thank you Kathy P in White Lake, MI!! A perfectly packaged package filled with lovely cards! Love your Father's Day cards! Thank you!! Thank you Maria L in Stamford, CT for your cards and donation! Love the Mother's Day cards with the butterfly ribbon. Clever! Melissa R, Marysville WA - thanks so much for the half&half cards - plus the extra envies! Thank you Barbara H. in Bowman, GA, for the gorgeous cards, the hero letters and the generous donation! You are VERY talented! Many thanks to the talented ladies, Scrapbook Concepts Cardmakers, in Florence, SC!! Thank you Linn, Stacey, Karen, Devon, Rhonda, and Bev! Thanks too for the generous donation! Thank you Caro H. of Mint Hill, NC for these terrific cards! See you at the LSS for the next card day! Darlene McG, Ridgecrest CA, what awesome cards - love them! Your donation and all the extra springy goodies are much appreciated! Thank you Debbie K. in Burke, VA. Your cards are always beautiful. Thanks for the cards for the children! Thank you too for your donation for shipping! Thank you Dee N in Duluth, MN for this wonderful box of cards for our heroes! I love the cat in the popcorn card! Funny!! Diane G. in Barberton, OH, your cards are wonderful! Thank you for the many cards and the letters to heroes. Thanks for making so many cards for the children! Dolores A. in Frederick, MD, you ROCK! Thank you for the terrific cards and the letters to our heroes. Lots of springtime on your cards! 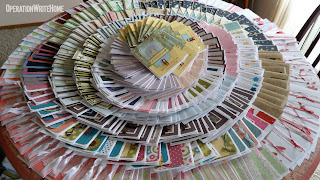 Thank you Eileen M and the CardMaking Parties for OWH in St. Marys, PA!! Well done! Those Mother's Day cards are already packed to ship. Thanks too for the hero letters and the generous donation! Janice A, Bountiful UT - such pretty Half&Half cards, you're really blessing our heroes...thank you for your generous gift too!!! Kathy C, Liverpool NY - your generosity is astonishing, thank you! Thank you Stephanie C and Huton Baptist Church in Glen Allen, VA for the beautiful "Thinking of You" cards. They're perfect! Thank you Susan A. in Ridgewood, NY for the pretty cards you sent for our heroes! They're great! Wendy L. in Circleville, OH!! Great Mother's Day and Father's Day cards! Thank you! Love the kraft cards especially! Hello friends...Sandy here! I just wanted to share a quick hello tonight - I am just so excited!! I got to meet one of our heroes this evening! A Chaplain who we supported for quite some time came to my church's care package packing party, and I was able to spend half an hour or so chatting with him....what an honor! :) He brought his daughter with him too, a beautiful young lady who is thrilled to have her Dad back home! Stay tuned to hear more from him in the future (since he's local! )—but I wanted to share with you just how much he and his unit loved the cards! He said the selection they have access to is just awful, and having the boxes of handmade cards is a real treat. And having our "Operation Write Home" labels on the side, and tabs separating the themes of cards in between each section, the box is ready to go—so they're thrilled with what we do! And, dummy me—I didn't even think to get a photo with him! Agh! Next time. The Half and Half challenge deadline is nearing....get the to the shipper by the 15th to get your entries counted! Ten prizes are up for grabs! Mother's Day deadline is April 1 - and if you're doing many multiples of one design (over 30), please make it sooner than that so we are able to spread them out among many boxes!